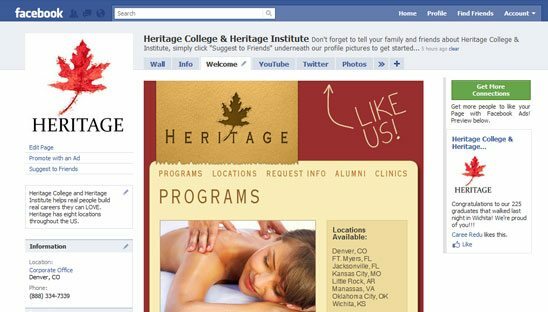 Every Heritage school (Heritage Institute & Heritage College) helps real people build real careers. Our schools offer programs and degrees for a career as an X-Ray Medical Technician®, Medical Assistant, Massage Therapist, Esthetician, Surgical Technologist, Personal Trainer, or Pharmacy Technician. Please note that all programs may not be offered at all schools. This was a very large facebook fan page design. We created 5 tabs within the main tab which practically turned this facebook page into a mini website.